Coinbase vs Gemini: which digital exchange should you choose when purchasing cryptocurrencies? Where can I buy cryptocurrencies securely? How do I buy cryptocurrencies easily? What is the cost to buy or sell cryptocurrencies? 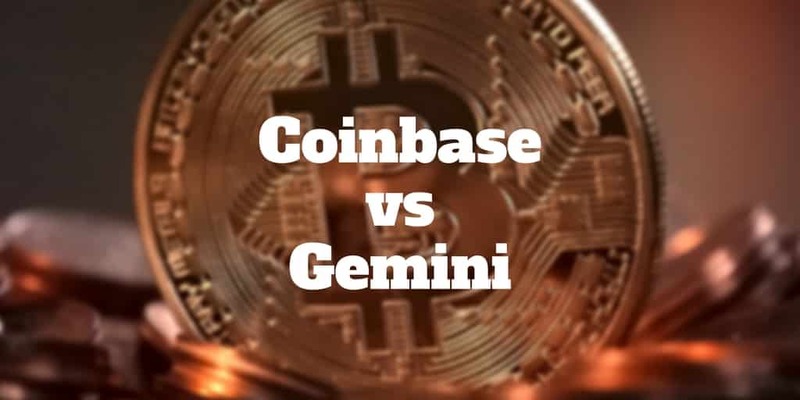 In this Coinbase Vs Gemini review, we compare two U.S. based online companies that allow you to buy and sell cryptocurrencies and have established solid reputations among their respective communities of users as well as from renowned investors. Where To Buy Cryptocurrencies: Gemini or Coinbase? Coinbase is a digital currency exchange based in San Francisco that was founded in 2011. If you are a newbie to the world of cryptocurrencies, perhaps the hardest first step to figure out is where you go to buy or sell bitcoin, ethereum, or litecoin. Coinbase recognized that while whiz kids who are technology savvy could figure out how to mine bitcoins and other cryptocurrencies, the average Joe or Jane investor had no online destination to easily purchase crypto coins using credit or debit cards. The company got its start in the highly prestigious start-up accelerator program, Y-Combinator, and within a couple of years received its first round of funding for $5 million. Since then, Coinbase has gone on to raise hundreds of millions of dollars in venture capital and serves tens of millions of customers. While Coinbase has been backed by some of the most successful investment professionals, including Andreessen Horowitz and Draper Fisher Jurvetson, the question remains is Coinbase safe? So far, the company has had a good record of security and grown internationally to allow users in over 25 countries to buy and sell cryptocurrencies and provide cryptocurrency wallets to users in 190 countries. Gemini is a digital currency exchange platform founded by the Winklevoss twins: Tyler and Cameron. If their last name rings a bell, it’s because the Winklevoss twins were featured in the movie The Social Network. They claim to have had the original idea for Facebook and ultimately received a settlement of approximately $65 million from the social networking site. But they didn’t rest on their laurels following the payout. Instead, they invested $11 million into purchasing bitcoins when bitcoin was valued in the single digits. And in 2015, they received approval from the New York State Department of Financial Services to launch a digital currency exchange called Gemini, which caters to both new cryptocurrency investors and professional traders. But when you compare Coinbase Vs Gemini, which is better? Gemini charges lower fees than Coinbase but has fewer payment methods – you cannot purchase via credit card or debit card at Gemini as you can at Coinbase. When it comes to fees, Gemini has the advantage over Coinbase, which charges a premium to transact. At Coinbase, you can purchase bitcoin, ethereum, or litecoin using a credit card, debit card or bank transfer. When selling cryptocurrencies, the fees charged are similar. ACH transfers are free but wire transfers cost $10 at Coinbase. For stock, options, futures, or forex traders, these costs are eye-popping. Each time you buy and sell bitcoin, ethereum, or litecoin you will pay a round trip charge that is nearly 3% at the low end and could be significantly higher. Compare those costs to the fees charged by leading brokers to buy and sell stocks like Alphabet or Amazon, and you will quickly realize that paying for cryptocurrencies is as expensive as paying for stocks before Schwab and other discount brokers made buying and selling more accessible to the ordinary investor. Gemini caters to both new cryptocurrency investors and professional digital currency traders. It charges a base fee of 0.25% to buy and sell but your fee rate depends on the trading pair you select and the volume you trade on both the continuous and auction order books over a 30 day calendar trailing window. So let’s say you were to enter an order to purchase $30,000 of bitcoin (BTC) with a limit price of $15,300 which fills at an average price of $15,000 per bitcoin. How much would you pay in fees at Gemini? When you buy cryptocurrencies at Coinbase, it may take up to a week to process the order and receive your digital assets but the quote you receive is the price you pay when checking out. When you buy cryptocurrency at Coinbase, the price is set at the time of purchase. After verifying your bank information, you can immediately purchase bitcoin, litecoin, or ethereum with a credit card or debit card. And while the price is locked in when paying by bank transfer, you will need to wait a few days for the digital assets to settle in your account. Sometimes it can take as much as a week to process an order. Whether the price rises or falls in the interim period, your cost basis is the price quoted at purchase. 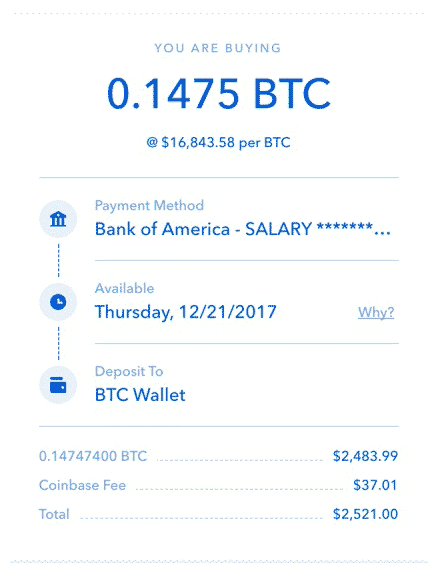 When you log in at Coinbase, a bitcoin order entry would look similar to the one below where you are quoted how much bitcoin you will own, the current price of bitcoin, the payment method you are using (in this case a Bank of America account labeled Salary), and when your bitcoin will be available in your account. Plus, you get to see how much you pay in Coinbase fees. At Gemini, you can immediately trade cryptocurrencies after depositing funds via bank transfers. Even before your funds are fully deposited, you can begin trading but you cannot withdraw funds until your deposits settle. The way it works is you create your account, verify it, deposit U.S. dollars, and place an order on the exchange. As soon as the order is processed, you receive your digital assets, which can be withdrawn as soon as your deposit has been processed and fully settled. Gemini limits you to bank transfers of $500 per day whereas Coinbase imposes variable limits. Both Coinbase and Gemini are regulated in the U.S. and licensed to engage in money transmission. When you log into Coinbase, you will be required to follow a two-factor authentication protocol. You will need your email and password at step 1 and at step 2, and you are required to enter an authentication code from a mobile authenticator app that you download onto your mobile device. The code changes every 30 seconds for enhanced security. But don’t worry if you miss the first code, you can enter another code and Coinbase will recognize it as being correct. All digital currency held at Coinbase is fully insured, meaning that if a security breach occurred, the insurance policy would pay out to cover any customer funds lost. Gemini is a trust company that operates as a fiduciary, meaning that it must meet compliance, capitalization, anti-money laundering, cybersecurity, and consumer protection standards set forth by the New York State Department of Financial Services (NYSDF). Your U.S. dollar funds are FDIC insured subject to applicable limitations however your digital assets are not FDIC insured because the U.S. government does not insure digital assets. Regardless, Gemini does claim to be insured by a top tier insurance company to protect you from internal malfeasance. And like Coinbase, two-factor authentication is used to heighten security protection when logging into your account. ✅ Variety Of Cryptocurrencies: Bitcoin, Ethereum, and Litecoin can be traded at Coinbase while Gemini supports Bitcoin and Ethereum. ❌ Fees: To buy, sell, and exchange cryptocurrencies, Gemini is cheaper than Coinbase. ✅ Security: Both Coinbase and Gemini are regulated and insured, but Coinbase insures all your digital assets whereas Gemini is FDIC insured, meaning your dollars are insured up to applicable limits. ❌ Trader Friendly: Gemini offers attractive fee discounts based on volume to traders who wish to transact often whereas the cost of frequent transactions at Coinbase could quickly become prohibitive due to high transaction costs. ✅ Two-Factor Authentication: Coinbase employs two-factor authentication for heightened security. ❌ Two-Factor Authentication: Gemini also provides users with two-factor authentication for increased safety of funds. ✅ Established History: Coinbase started a few years earlier than Gemini and has significant funding from leading venture capitalists. ❌ Cryptocurrency Exchange: Gemini is like a forex exchange where you can exchange one kind of cryptocurrency for another or simply buy crypto coins with fiat currency. ✅ Trading Limits: Coinbase imposes variable limits which may be larger for new users than those at Gemini. ✅ Cryptocurrency Wallet: Coinbase provides a cryptocurrency wallet where you can store your digital assets. ✅ Payment Methods: Coinbase supports a wider variety of payment methods to purchase cryptocurrencies, including credit cards, debit cards, bank transfers, and Paypal. Coinbase and Gemini both make it possible to buy and sell Bitcoins and Ethereum but if you wish to purchase Litecoin, Coinbase has the edge. When it comes to buying and selling cryptocurrencies, both Gemini and Coinbase support bank transfers but Coinbase also caters to credit card and debit card transactions as well as Paypal. You may also enjoy more relaxed trading limits at Coinbase than at Gemini. But where Gemini shines is on fees. Cryptocurrency traders who wish to transact often will find Gemini to be a less costly platform. And Gemini even provides discounts as you trade with ever higher volumes. When comparing Gemini vs Coinbase on security, they both earn top marks, though Coinbase gets the nod when it comes to insurance because Gemini provides FDIC insurance with applicable limits while Coinbase includes full insurance coverage as part of its service offering. The bottom line is if cost and trading frequency are your primary concerns, Gemini has the edge while Coinbase receives higher marks for making it easier to buy and sell, supporting more cryptocurrencies, and providing a higher level of insurance.